As well as giving us a chance to read (or reread) some of the best works of literature from the past forty years, the advent of the Picador Classic series also seemed the perfect opportunity to ask the authors some big questions – about life and literature, their current obsessions and how times have changed. Notes are merely notes, I’m afraid, and wouldn’t mean anything to anyone else. Indeed, sometimes I look at a note I made myself the previous day and am baffled. Italy. Lucca. And there is a restaurant in Siena, Osteria Le Logge, which is one of my favourites in the world. Also, I have a friend who has a beautiful old house – eleventh century – in the countryside south-east of Florence, where it’s always a delight to visit. Everyone should have such friends, yes? Tell us your favourite poem. I don’t think I have one special poem, although I do confess to being haunted by Robert Frost’s ‘After Apple Picking’. The poets I return to again and again are Yeats, Rilke, Elizabeth Bishop, Philip Larkin, Wallace Stevens, not necessarily in that order. I also think of Nietzsche as a poet, especially in Fröhliche Wissenschaft (Cheerful Wisdom). Finishing the novel I’ve been working on since January 1st 2012. One of us will have to go. . . I hope to be surprised by something unexpected and magical. That is the wonderful thing about literature: there is always an author or a book one doesn’t know yet. Which writing do you find yourself returning to and why? Poetry, philosophy. I like literature that has a thinking brain behind it. Which other author would you most like to have for dinner and why? William James. I cannot imagine anyone being better company. The Third Man. Best movie ever made. And your favourite music or music genre? What used to be called classical music. A nightmare I had at the age of four or five. We were told in nursery school by the kindly nuns that if we told lies, after we die one of our arms would stick up out of the grave. I dreamt that I was walking through a cemetery, and every grave had an arm sticking out of it. A graveyard of bristling arms. Well now, take a wild guess. And the last thing you do at night. Oddly, it was John Updike’s Rabbit at Rest. The death of Rabbit Angstrom affected me deeply, I’m not sure why. I told Updike I had wept at the close, and he remarked with cool irony that he hoped Rabbit’s going wasn’t sadder than the death of Little Nell. Molloy, by Samuel Beckett, or almost anything by Nietzsche. Three things you would want on a desert island. Fountain pen, paper and a giant bottle of ink. How prosaic. What was your greatest piece of luck? 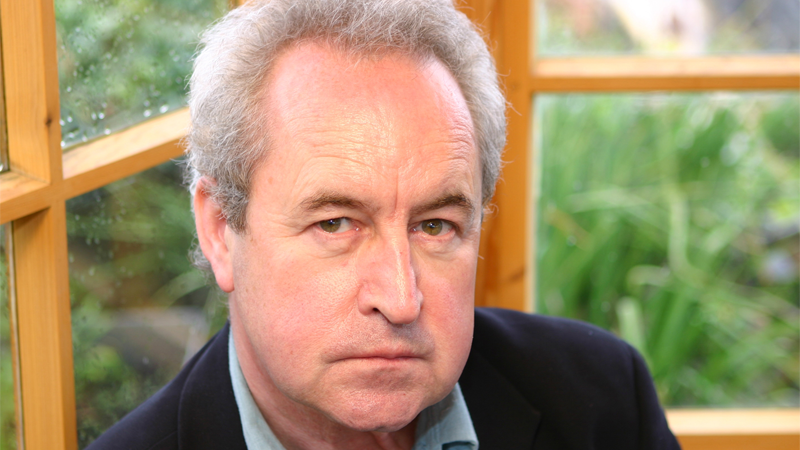 Winning the Man Booker Prize in 2005. Pure fluke, and no one, but no one, expected it. Very gratifying. What’s the worst or most unusual job you’ve had? Working in the Telegraph Office in London, back in the 1960s. Four nights week, 7 p.m. to 8 a.m.. My job? To collect bundles of sent telegrams every hour on the hour, punch a hole in the corner and tie them together with string. If your collection of books was ravaged by a fire and you could save only one, what would it be, and why? I know a world-­renowned bookbinder, Tony Cains, who lives in Dublin. He’s retired now, but he makes handmade books for me to write in. I’d have to take the manuscript book I’m working in now. The novel I could do without, but it would be a shame to lose such a lovely artefact to the flames. The Book of Evidence (Picador Classic edition) is introduced by Colm Toibin.